As the German luxury trio battle it out more fiercely than ever before, Mercedes and Audi are readying new entrants to fight it out with the BMW 3 Series. If virtue is in the middle – as good old Aristotle maintained – the mid-sized cars should be the apple of their makers’ eye. Instead, in the last ten years (thus, long before the current crisis), the mid-sized category has been misfiring – both in absolute numbers, and, perhaps more worryingly, in percentages. From 2002 to 2012, its share of registrations in Europe have fallen by five percentage points to under 15% currently. And yet, Audi and Mercedes – as BMW has already done with the 3 Series, and as Jaguar plans on doing as well (see pg.94) – are investing time, money and resources with the goal of reinventing their respective medium-sized models, the A4 and the C Class. This is because, even though the decline is widespread in Europe, this segment continues to represent the heart of the business globally for these elite brands. Even in 2012, in fact, the A4 – with almost 330,000 units – remained Audi’s most successful model, with a percentage of the total sales that exceeded 22%. With 413,193 deliveries (almost a third of the brands volume), the C-Class confirmed itself as the highest selling Mercedes, and Queen of its category. Virtuous mid-sized models, then – returning to Aristotle – are something of a necessity. In 2011, it was BMW that opened a new chapter in the long-standing feud with the sixth generation 3 Series (which holds the sales record in Munich, and which, in the first half of 2013, grew by 21.8% compared to the same period in 2012). In less than a year, Mercedes will try to match that feat, along with Audi, which is expected to launch the new A4 before the summer of 2014. For the ‘Star,’ it’s imperative to secure a clientele slightly younger than today’s 50-year-old majority. Thus, to start with, a new, fresher image would be in order. In the new C Class, there is a need to stir the soul of the driver to transmit feelings of fluidity and lightness. Because, with the CLA positioning itself as a quasi-C Class, the only remaining option is for the C to become a smaller scale S Class. Its length, which today is approximately 4.60 meters, will shoot past the 4.70 mark, so as to provide more internal space without adding weight to the design, which forms a quasi-coupe type profile with heavily sculpted sides. The loss in weight is not only for visual effect though. Thanks to the use of composite materials, and the downsizing of the tank, the new C Class will feature reduced weight (70kgs lighter according to initial rumors). This, added to a drag coefficient that falls from 0.27 to 0.25, allows Stuttgart to declare an expected fuel consumption reduction of up to 20%. Much of the merit for this obviously goes to the engines. Under the hood, essentially the same engine range will be housed for the world market – the four-cylinder 1.6 to 2.0 litre turbo petrols with power between 156 and 252bhp, the 333bhp 3.0 litre V6, and the twin-turbo V8 for the C63 AMG. Also, presumably confirmed is the 170, 204, and 231bhp 2.1 litre turbo-diesel, unless Mercs goes for downsizing to 1.8 litres, which will deliver 109 or 136bhp. There are also two eco-friendly versions being considered. There will be a mild hybrid, propelled by a 204bhp diesel engine and a 27bhp electric motor, and a plug-in hybrid with a petrol engine capable of guaranteeing a 50-kilometer zero-emissions range. Obviously, this will be rear-wheel drive (or with 4Matic, all-wheel drive), paired to a six-speed manual transmission or the 7-speed 7G-Tronic automatic. The long-awaited nine-speed automatic transmission (which should make its debut in the new E Class by 2016) will not be available at the time of launch. The sedan will hit showrooms next summer, after which Europe will get an estate, a coupe, and canvas-top cabrio by 2015 – designed to substitute the CLK. If the increase in space translates into prestige, that of the C Class will be bolstered by more efficient adaptive suspension settings and by an improvement in the soundproofing – in addition to the most modern driving-assistance systems. Lastly, there’s the added attention to the latest multimedia frontiers. Though not yet confirmed, there’s the fascinating possibility of controlling the infotainment system by simply making certain hand gestures. The answer from Ingolstadt will be immediate. 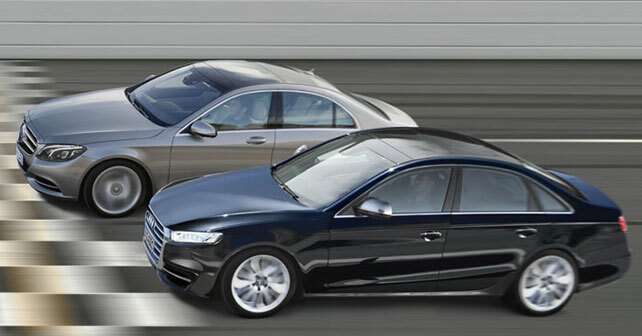 As soon as the summer of 2014, the fifth generation A4 will debut with the sedan, and the station wagon in Europe. In 2015, the A5 coupe will be launched, which will be followed a year later by the convertible. Everything would follow tradition, were it not for rumours about an opulent Gran Turismo model – created on the long wheelbase of the A4L model (sold rather successfully in China). A stylistic evolution of the single frame grille philosophy (now with ten years behind it), on the other hand, is out of question. Besides the distinct treatment of the famous grille – now three-dimensional and specific for every model family (sedan, sport cars, SUVs), the sides are marked by a more decisive line and a more angular tail. Created on the MLB platform (Modular longitudinal matrix), the development responsibility for which Audi holds within the Volkswagen group, and lightened by 50kgs thanks to the latest research, the A4 sedan should not grow in length by too much. The wheelbase, on the other hand, will grow at least a centimetre – for the benefit of the passenger compartment, where the most interesting novelties are once again in the multimedia sphere. At the centre of the system, there is still the Multimedia Interface (MMI) knob – the device that controls all the entertainment and navigation functions, to which there will be the addition of a touchpad able to read touch gestures and respond via vibration to the requests of the driver. On the safety front, the debut of a head-up display is to be highlighted (included only after many a heated discussion), in addition to a plethora of active and passive systems, enriched by the new A4 with programmable digital displays. As far as the range of engines worldwide go, the 1.8 TFSI will probably make way for the 1,400cc cylinder-on-demand engine used on the A3 and Golf, with a power of either 122 or 180bhp. With the 2.0, we would see 225 and 286bhp. The 340bhp 3.0 litre V6 is reserved for the sporty S versions, coupled with the latest evolution of the double-clutch transmission. The diesel range, on the other hand, is more conservative – the 218 and 272bhp 3.0 V6, along with the 150 and 184bhp 2.0 litre are confirmed. The latter, however, is enhanced by a 122bhp TDIe version, which is responsible for bringing down fuel consumption. On the hybrid front, the A4 will have its plug-in version, derived from the Q5 – the 225bhp 2.0 TFSI acts in synergy with two electric motors co-located at the rear so as to distribute torque to the four tyres without the need for an additional driveshaft.